During Japan’s Edo period (1603–1868), it was customary for young, unmarried women to wear furisode, a type of robe with long, hanging sleeves. Young women of the merchant and warrior classes preferred opulent, even somewhat flamboyant designs. The design and decoration of this robe suggest that it was once a furisode for a younger woman who kept wearing it after she was married but shortened its sleeves to reflect her new status. It is lavishly decorated with an overall pattern of peonies, chrysanthemums, wisteria, and chūkei (a type of folding fan). 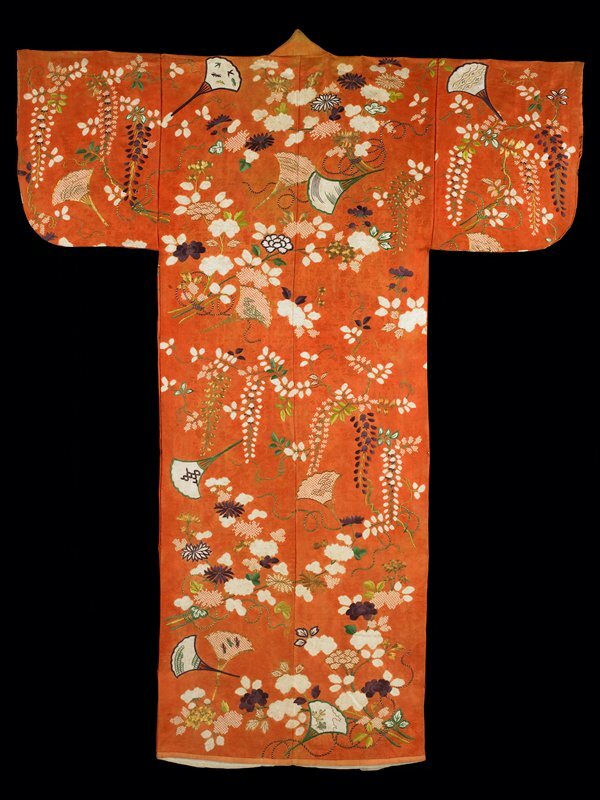 The underlying silk was dyed with safflower to produce the robe’s reddish-orange color, often used for young women’s clothing.